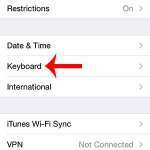 You are here: Home / Mobile / Where Is My Hotspot Password on My iPhone 6? 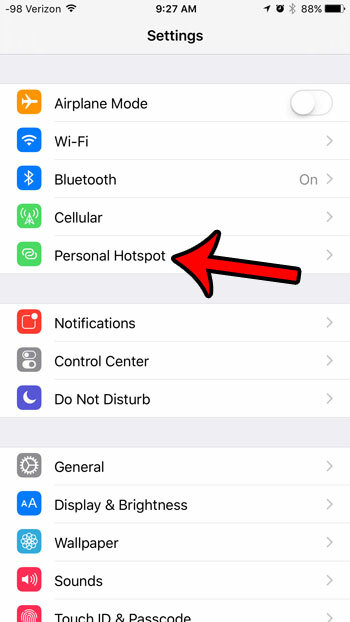 The Personal Hotspot feature is available to iPhone users that have their devices connected to a cellular network with a provider that allows the Personal Hotspot functionality. 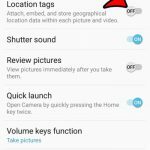 This feature can be extremely helpful when you are traveling in a car, or are not near a Wi-Fi connection, and need to use a device that does not have its own cellular capabilities. The most common types of devices that would need to connect to an iPhone’s Hotspot include laptop computers and tablets. But in order to connect to an iPhone Hotspot, you need to know the password. 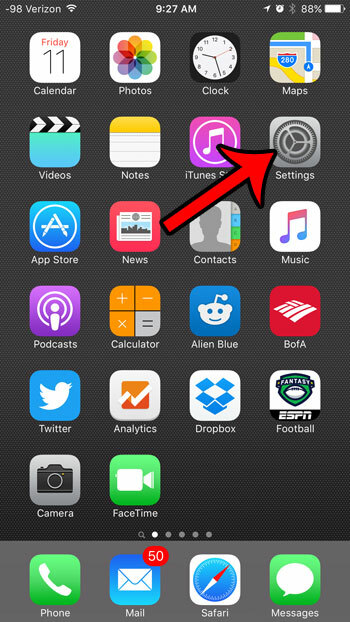 Our guide below will show you where to find the Hotspot password on your iPhone so that you can share it with others. The steps in this article were performed on an iPhone 6 Plus, in iOS 9.3. Note that using your Hotspot to share your iPhone’s cellular data connection with another device, such as a laptop, can cause you to use a lot of data. Be mindful of how that connected device is using your Hotspot connection if you have a limited amount of cellular data each month. Step 2: Select the Personal Hotspot option. If you do not see a Personal Hotspot option on the menu, then you will need to enable it by going to the Cellular menu and turning on the Personal Hotspot option. Step 3: Locate the Hotspot password next to Wi-Fi Password. 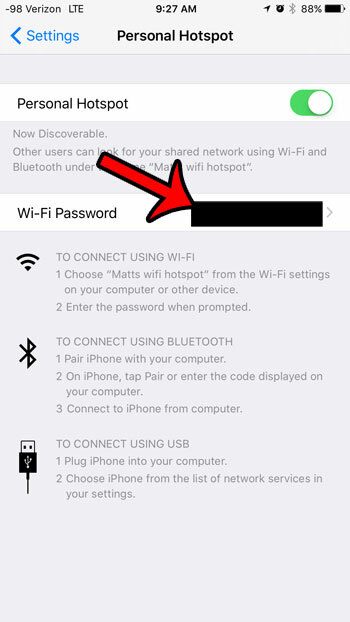 Note that you can change the Hotspot password if needed by tapping the Wi-Fi Password button, then deleting and creating a new one. Are you connected to a Wi-Fi network, but your Internet connection is slow or non-existent? 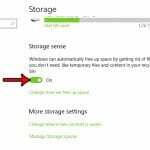 Learn how to disconnect from Wi-Fi and connect to cellular to use that data connection instead.